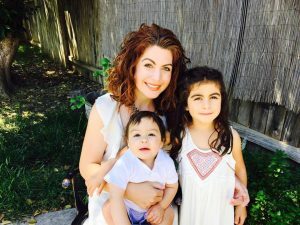 Having a family and becoming a parent shouldn’t affect your career in science, says #ScienceMama Becca Calisi. Becca Calisi is an assistant professor at UC Davis, California, where she runs a lab studies how the environment affects the brain, behaviour and health. She has one 6 year old daughter, who arrived whilst she was a postdoc at UC San Diego, and a 1 year old son who arrived whilst she had her permanent position at UC Davis. In between that she spent time doing research in New York. If you want to find out more about post-partum depression, the US National Institute of Mental Health has some information about it, as done the National Health Service in the UK. Don’t forget you can also listen (and subscribe!) to the ScienceMamas podcast on iTunes and on SoundCloud!